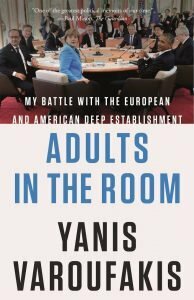 Yanis Varoufakis, Adults in the Room: My Battle with the European and American Deep Establishment (2017). One evening in spring 2015, a finance minister walked into a bar in Washington, D.C., looking for some insider advice. No, this is not one of those man-walks-into-a-bar type jokes, or a-priest-a-rabbi-and-an-imam-walk-into-a-bar or even A Horse Walks into a Bar story (to cite the title of David Grossman’s recent novel, winner of the Man Booker International Prize for 2017.) On this occasion, the man walking into a bar is Yanis Varoufakis, the then newly-minted finance minister of virtually bankrupt Greece, and the person with whom he’s having a drink is Larry Summers, one of the American capital’s real insiders. 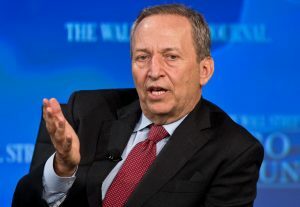 Indeed, Summers, the former U.S. Secretary of the Treasury in the Bill Clinton administration, former President of Harvard University, and former Director of the National Economic Council during President Barack Obama’s first term in office was once a consummate Washington player. The evening ends in a spring rainstorm. “As I saw him to a taxi,” Varoufakis recalls, “the downpour soaked my spring clothes in seconds.” Rather than dismay about the drenching, “I had the opportunity to realize a wild dream of mine… to walk alone, unnoticed, in the rain.” There will be several more occasions in the coming weeks and months, in Athens and other capitals across Europe, where Varoufakis finds himself in “pristine solitude” on long, often late-at-night walks as a break from the noise of politics and the strange boredom of bureaucratic life. For those unfamiliar with what happened in Greece nearly three years ago, in 2015, and why it matters (or for those who have simply forgotten, since amnesia is an increasingly common affliction in this era of Donald Trump-inspired hyper-speed news cycles), a brief reprise of the situation may be in order. The financial conditions facing the early-50ish, telegenic Greek economist, who held professorships at both the University of Athens and the University of Texas at Austin, as he contemplated whether or not to enter politics in his Aegean homeland were, to put it mildly, dire. Of all the countries hit by the global Great Recession of 2008, few were more damaged than Greece, a small, southern European nation of some 10 million inhabitants. In 2015, long after the international fiscal meltdown and the partial recovery of less devastated economies, Greece was still suffering from 25 per cent depression-level unemployment (over 50 per cent among young people), a GDP that had shrunk more than a quarter from pre-crash levels, and a third of whose population was living on the edge of or below officially designated poverty lines. Although those are the kind of statistics of distress that cause eyes to glaze over, it’s useful to remind oneself that the abstractions represented real people: senior citizens whose pensions became almost worthless; whole families living on one of those shrinking pensions; the young, deprived of a future and forced to flee the country to look for work and sustenance elsewhere. The precarious situation obtained despite more-than-250-billion-euro “bailout” loans, ostensibly directed to the Greek economy by the European Union in 2010 and 2012. In reality, the bailout money was used to rescue European banks, mainly in Germany and France, who had made bad loans (which they likely knew in advance were bad loans) to governments in Greece and other struggling economies. The money from the EU bailout loans did not go toward a restoration of the Greek economy, claims to the contrary notwithstanding – a point Varoufakis underscores in his book. Further, despite widespread publicity to the contrary, the fault for the ongoing failure didn’t lie entirely with the Greeks. “I fairly often encounter assertions to the effect that Greece didn’t carry through on its promises, that it failed to deliver the promised spending cuts,” Krugman observed. “Nothing could be further from the truth. In reality, Greece imposed savage cuts in public service, wages of government workers and social benefits.” The claim that “the direct job-destroying effects of spending cuts would be more than made up by a surge in private sector optimism” proved false. All of this matters, first and obviously, because of the suffering endured by thousands of Greek families and, more broadly, because the fiscal disaster in Greece was, and remains, a litmus test of the ability of the European Union to actually live up to its ideals in the face of serious crises. Indeed, the future of the EU as the great mid-20th century utopian vision of a peaceful, prosperous Europe is probably more dependent on its political response to Greece than the far-more-publicised Brexit referendum decision in 2016 that will see the United Kingdom abandon its membership in the European consortium. That, in part, is why Varoufakis’s account of what goes on inside the EU decision-making institutions to which he briefly had intimate access matters so much. Many people find Varoufakis a sympathetic figure in a landscape of fiscal bean-counters who are often colorless and obtuse. 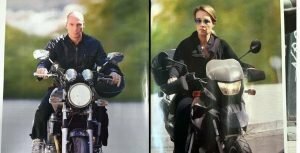 That empathy extends to a somewhat flamboyant personal style in which he’s garbed in T-shirt and chic leather jacket, aboard a motorcycle circumnavigating the roads around Athens’ Acropolis. Admittedly, such a perspective is not shared by everyone. His opponents painted him as an arrogant showboat, and weren’t shy about making their views known to the media; indeed, the smear campaign against Varoufakis personally (as “amateurish,” condescending, bereft of ideas or possessed of bad ones, etc.) was part and parcel of the EU insistence on carrying out its austerity program in Greece. 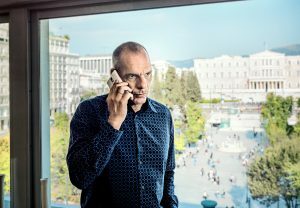 How Varoufakis came to find himself running for political office in the pivotal January 2015 Greek parliamentary elections is a crucial part of the story and much of how one reads this memoir hangs on it. He arrived in the Greek electoral forum as a well-traveled academic – educated in England at the universities of Essex and Birmingham, he had teaching stints in the UK, Australia, and the U.S. before settling at the University of Athens at the beginning of the century – and he maintained a sideline as a controversial TV pundit and op-ed writer. Varoufakis presciently told an economics conference on the Greek budget in December 2006, “Today we are threatened by the bubble in American real estate and in the derivatives market… If this bubble bursts and it is certain it will… none of this budget’s figures will have a leg to stand on… The question is not whether this will happen but how quickly it will result in our next Great Depression.” Since a couple of Varoufakis’s fellow panelists were former finance ministers who took the line that Greece was somehow impervious to such dangers, their brash colleague’s Cassandra-style warnings were seen as somehow unpatriotic, thus initiating accusations against Varoufakis as a “national traitor” – that is, when he wasn’t simply being treated as “an inconvenient fool.” In the event, the bubble did burst, Greece was not impervious to the storm, and a virtual tsunami of economic disaster rolled out of the Aegean Sea. Varoufakis’s anticipation of the financial catastrophe led to frequent public appearances as a popular TV commentator on economics and an occasional speechwriter and adviser to the social democratic George Papandreou government of 2009-11, during the Greek debt crisis. It was Varoufakis’s public admonitions to the Greek government not to seek bailout loans to avert bankruptcy that produced titillating European headlines to the effect that “Former Greek PM adviser says Greece is bankrupt.” Again, this unpopular anticipation of the facts was viewed as a lack of patriotism; eventually, the disobedient economist was blacklisted from both state and private TV channels, almost all of which are controlled by the Greek oligarchy. There was also a serious death-threat phone call made against Varoufakis and his wife Danae’s teenage son – the economist cites it as one of the reasons he and his family took up residence at the University of Texas in the years preceding the 2015 Greek elections. 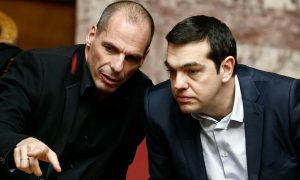 Yanis Varoufakis (l.), Alexis Tsipras (r.). It was this wide range of public and academic activities that made Varoufakis attractive to the Syriza Party, and its mid-30ish leader, Alexis Tsipras. The leftist party (itself a coalition of various Greek political factions) was in the process of becoming a significant player in Greek politics, circa 2012, when Nikos Pappas, Tsipras’s chief of staff and an economist himself, brought Tsipras and Varoufakis together. Although Varoufakis initially found the “young prince” of Greek politics distracted by internal feuds within Syriza and insufficiently focused on the crucial economic questions, he gradually warmed to Tsipras, discovering him to be a quick study once he set his mind to the issues at hand. In terms of how to negotiate with the EU, Varoufakis insisted on absolute good-faith negotiations that included a specific but politically moderate plan to “restructure” Greece’s massive debt, and to ameliorate the austerity program in the name of what Syriza called the “humanitarian crisis.” So, for instance, Varoufakis was not suggesting a blanket write-off or “haircut” of the debt, but rather a very long-term repayment plan tied to Greek economic recovery and growth-rate percentages. At the same time, the overarching idea was to commit to continued membership in the EU and the Eurozone. In contrast to Syriza’s internal left caucus, Varoufakis opposed the idea of making an exit from the Eurozone (a “Grexit”) a campaign goal and, equally, he opposed those within the Greek political establishment who wanted to further extend the bailout in return for accepting a continuation of what Varoufakis called the “fiscal waterboarding” of the EU austerity program. Instead, Varoufakis offered a more sophisticated strategy. 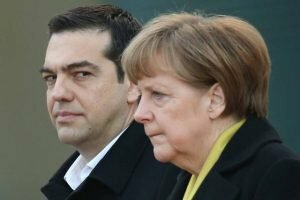 If, in the end, the EU refused to modify the terms of the debt and austerity deal, then, rather than bluffing or accepting a continuation of the situation in return for a third bailout loan, the Greek government should be prepared to take the Grexit route out of the Eurozone, while remaining in the EU. This strategic approach entailed two practical plans. The first had to do with Greece’s proposals during negotiations with the EU, and the second involved what to do if negotiations failed and Greece returned to a devalued national currency, the drachma. Varoufakis had been working on all aspects of his approach in concert with various other economists during his time at the University of Texas at Austin, principally with Jamie Galbraith, the son of the renowned economist John Kenneth Gabraith and, like his father, a proponent of Keynesian strategies for depression recovery. 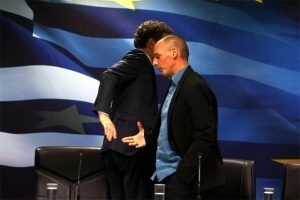 The only question for Varoufakis was whether Alexis Tsipras would be willing to commit to such a strategy in the face of internal opposition from Syriza’s Left Platform, as it was known, and from the right in the form of powerful bureaucrats, bankers and the EU insiders themselves. Varoufakis had expected that he might be asked lend a hand to a Syriza governent’s negotiations. Instead, Tsipras not only accepted Varoufakis’s strategic proposals, but offered the economist the key post of Finance Minister should Syriza win the election, which had been pushed forward to the end of January 2015. Rather than being parachuted into the position, Varoufakis insisted on running for a parliamentary seat and, more importantly, persuaded himself that Tsipras and his team would stand by the admittedly precarious plan Varoufakis had devised and that they had received with such preliminary enthusiasm. This initial agreement within Tsipras’s inner circle raises a host of questions that can’t be resolved here, but which should at least be broached. How realistic was it to enter the fray with even faint hopes that the EU was prepared to substantially restructure the deal, or that it would do so once it saw that Tsipras and Varoufakis were serious about Grexit? If it was possible to anticipate the EU’s intransigent stance on maintaining “austerity,” as would quickly become apparent, wouldn’t it have made as much sense to simply invest one’s energies in a Grexit from the Eurozone as Syriza’s Left Platform had called for from the start? Second, how plausible was Varoufakis’s package of proposals for a restructured deal? In a sense, that’s an argument best left to economists but, minimally, we can note that Varoufakis’s ideas made sense to a raft of professionals in the field, including the younger Galbraith, Jeffrey Sachs, Joseph Stiglitz, and Paul Krugman. As well, Varoufakis’s arguments were sympathetically received by people with very different political positions, ranging from Larry Summers, to Britain’s former Tory Chancellor of the Exchequer, Norman Lamont, and to such political figures as U.S. Senator Bernie Sanders, and an obscure, youthful, appointed French economic minister named Emmanuel Macron, who in a couple of years would be elected president of France. Finally, wasn’t Varoufakis being willfully naïve in expecting to retain Tsipras’s political loyalty through thick and thin — and, more important, through the magical “spell,” as Varoufakis calls it, of German Chancellor Angela Merkel, and her finance minister, the influential Wolfgang Schaeuble? In the event, Syriza scored a landslide victory in the Greek elections of Jan. 25, 2015, securing a near majority of 149 out of 300 seats (Varoufakis himself led the polls among MPs elected), and quickly concluded a deal for a majority coalition with a small, right-wing, but anti-austerity party. 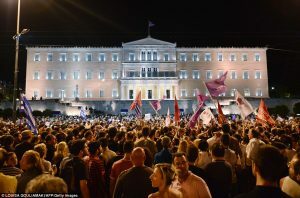 In jam-packed celebrations in Syntagma Square, the Athenian forum facing the Greek parliament, it was a night for the ages. Paul Krugman (in the column cited above, published the morning after the election) called it a “political earthquake in Greece” that had produced the first European government “elected on an explicit promise to challenge the austerity policies that have prevailed since 2010.” On the morning after the historic electoral night, Varoufakis was with Tsipras in the PM’s new office, lightly joking about their abruptly changed circumstances, before heading over to his own ministry. A few minutes after that poignant moment with the new Prime Minister, Varoufakis took one of his solitary walks – alone except for a few press stragglers, who were befuddled by a minister on foot, unaccompanied by security – over to the finance ministry from which he would preside, looking out a window onto Syntagma Square and across to the seat of Greek government. Varoufakis at the Finance Ministry. As the new minister sat in his office that evening, after talking to his wife who was in Austin clearing out their Texas apartment, the first official call from America came from, of all people, the socialist U.S. Senator from Vermont. Bernie Sanders wanted to know if there was anything he could do to support the new Greek government. He was just about to write a letter to Christine Lagarde, the IMF head, and wondered if there was something in particular that Varoufakis wanted him to say. It was, if nothing else, a much appreciated gesture of solidarity from a populist leftist who would be running for the U.S. 2016 presidental nomination within a few months, and who would turn out to be an unexpectedly strong candidate for the Democratic Party nomination (although, in the end, he would be edged out by Hillary Clinton). Sanders’s greetings were soon folliowed by an invitation to meet the U.S. Secretary of the Treasury Jack Lew, an offer from renowned Columbia University economics professor Jeffrey Sachs to more or less join Varoufakis’s team (an offer that was accepted), and even some kind words for Greece from U.S. president Obama. Since the Americans wielded considerable influence within the IMF, these first contacts were a hopeful sign. And thus Varoufakis, the “many-minded” Greek voyager (to recall an appropriate Homeric epithet) set off on an odyssey that would take him not only to magic isles with spell-casting sybils and caves occupied by cyclopian monsters, but to relatively sterile committee rooms, government offices, and the labyrinths of Brussels’ EU bureaucracy. I needn’t recount each and every meeting or cliffhanger moment in the ensuing fiscal negotiations. Anyway, Varoufakis himself does a surprisingly entertaining job of telling the story of the next six months of polite confrontation. Usually, books that are this heavily invested in financial mnutiae don’t exactly keep you up at night, but Varoufakis’s account has the narrative drive of a good detective novel. (By happenstance, I’d just read a pretty good California detective novel, Michael Nava’s Lay Your Sleeping Head, before getting to Varoufakis.) In terms of page-turning suspense, I’d say that Varoufakis’s book compares favourably to California private eye tales, although maybe the finance minister’s memoir is more akin to the surreal absurdities of Thomas Pynchon’s Inherent Vice than to, say, the melancholy classics of Raymond Chandler or Ross Macdonald. Election euphoria was quickly succeeded by the sobriety of Varoufakis’s first visitor, Jeroen Dijsselbloem, Dutch finance minister and president of the Eurogroup of finance ministers from Eurozone countries. There were the usual public pleasantries, and then the two retired behind the famous “closed doors.” One of the principal virtues of Varoufakis’s book is that it takes us behind those doors and tells us exactly what was said and done there. The angry Dutch Finance Minister sort of shakes hands with his Greek counterpart. After a few more minutes of fencing, “Jeroen told me, his voice dripping with condescension, ‘The current program must be completed or there is nothing else.’” In short, if the troka’s austerity dictates were not obeyed, Greece’s banks would be shut down, negotiations would be terminated, and Grexit would be imposed. It was the maximum hard line. At the closing pro forma press conference with the two finance ministers, Dijsselbloem more or less stormed off stage, barely pausing for the ritual departing hand-shake photo-op. Unfortunately, over the next six months, there was not much improvement in relations between Varoufakis and any of the Establishment colleagues with whom he ostensibly negotiated. Instead, Varoufakis provides incisive portraits of the EU insiders, and a lot of the insider conversation and gossip. As Varoufakis tours the European capitals, the major players perform their cameos, usually accompanied by promises upon which they fail to deliver. EU commissioner Pierre Moscovici, a former French finance minister, offers support privately, but in public his well wishes are unceremoniously squashed by Dijsselbloem. Poul Thomsen, the Danish IMF technocrat in charge of Greek and Portuguese programs, at one point not only sympathises with Varoufakis on everything from the Syriza agenda to ideas about debt swaps, but insists, “This is fine. But it is not enough. We need an immediate annulment of part of your debt. No swaps, no delays. Just take 53 billion Euros and erase it.” Varoufakis thought, as a very old cinematic cliché has it, that he was dreaming in technicolor. 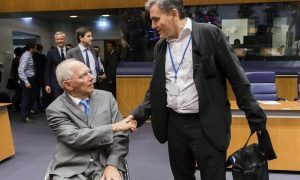 German Finance Minister Wolfgang Schaeuble (l.) with Greece’s Euclid Tsakalotos. Almost needless to say, it all comes to nothing, even though we get to meet the British Chancellor of the Exchequer George Osborne; the head of the European Central Bank, Mario Draghi; and perhaps most important of all, Wolfgang Schaeuble, Germany’s finance minister. His iconic image – wheelchair-bound as a result of a 1990 assassination attempt – is imprinted across Europe and Varoufakis provides a memorable portrait of him. There are a couple of delays or time extensions, but nothing substantive is accomplished. The troika continues to insist on its austerity program in return for a further bailout loan to pay off the previous unpaid loans. Meanwhile, back home, and to make matters worse, Varoufakis gradually lost the confidence of the inner cabinet in the incessant internal struggle between factions within the government. Most important of all, Tsipras cracked. This was a crack that, contrary to poet Leonard Cohen’s famous line, did not function to let in the light. There will be historical controversy over what happened, and since Tsipras is still in office as of this writing, we won’t really know for a while. Maybe Tsipras was gradually worn down by Angela Merkel and the other powers of Europe; maybe he was never as fully committed to resistance as he appeared to be. At some point, however, he accepted that Greece would bow to the will of the troika and sign on the dotted line. I vividly remember the night of the referendum, having watched it on TV from Berlin. A heat wave had engulfed the German capital and much of Europe for days. A couple of hours before midnight, the TV announced the referendum vote count. To everybody’s surprise — the pollsters had said the outcome would be too close to call — the Greeks voted an overwhelming 61 per cent aganst accepting the EU plan. The booming “No!” echoed across the continent. Varoufakis had campaigned heroically in favor of the No vote; he’d promised that if the Greeks voted to accept the EU proposal he would do the honorable thing and resign immediately (a pledge notably not made by Tsipras or any of the other cabinet ministers); and Varoufakis was surprised as the rest of us by the results. He had fully expected the vote would be to accept the EU plan. When the actual outcome was announced, he was stunned but exultant. In Syntagma square, thousands of citizens celebrated the unambiguous act of resistance. 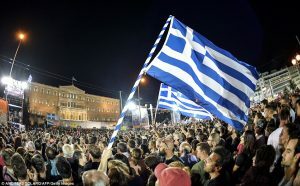 It was a modern, momentary, flash mob version of the historic and legendary “glory that was Greece.” That evening, as living room TVs, computer, and smartphone screens showed jubilant Greek crowds in the square in Athens, a magnificent storm burst over Berlin. There was lightning, thunder, wind whipping the courtyard trees, and a deluge of rain falling through the darkness, as people stood on their balconies in summer shorts (and less) to get a taste of the relief. It felt like an ecstatic pagan moment, Zeus unleashing a populist thunderbolt to rend the heavens. 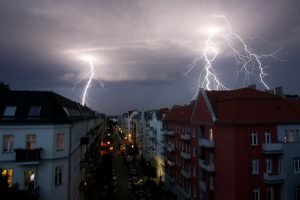 Lightning strikes over buildings during a thunderstorm in Berlin. REUTERS/Pawel Kopczynski. By dawn, Varoufakis had ended his career as finance minister of Greece. 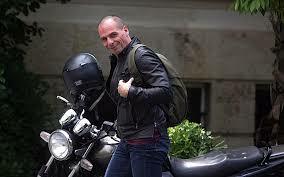 In due course, he rode off on his motorcycle on the winding roads aroud the Acropolis and toward the Parthenon temple or wherever ex-ministers go to contemplate their actions. A successor, Varoufakis’s friend Euclid Tsakalotos, was appointed; the troika deal was obedienty accepted (with both the Prime Minister and the new finance minister publicly admitting it was a bad deal); and Varoufakis, now an ordinary member of parliament, joined about three dozen Syriza colleagues to vote against the government. Since the official opposition supported the acceptance of the EU plan, the bill easily passed. A few momths later, in September, Tsipras called an early snap election to deal with the internal Syriza rifts, and was handily re-elected. Varoufakis did not stand for re-election. 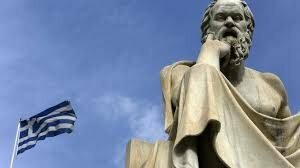 What came next, after the period on which Varoufakis’s memoir focuses, was a muddled two-year continuation of the dispirited negotiations that had characterized the Athenian economist’s tour of duty. Varoufakis tells an unexpectedly riveting story, about the nature of power, the ins and out of navigating through Europe’s “deep Establishment,” and of the thwarted but hopeful moments of attempting to recover a sense of national dignity. It’s a story with no shortage of villains, from the rather mean-minded Dijsselbloem to a corps of technocrats, both from the EU institutions as well as from inside the sporadically disloyal Greek bureaucracy. 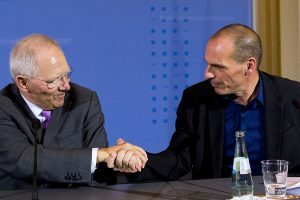 But if Wolfgang Schaeuble, the man often depicted in the media as the real villain of the piece, turns out, in Varoufakis’s view, to be a more interesting and real person than the caricatures make of him, is there someone or some institution that ought to be called out for their role in perpetuating the Greek depression and its human crisis? In reality, there isn’t a sole villain in this story; there is, rather, a particular system, a distinct version of contemporary capitalism that we call neoliberalism responsibe for the Grecian dilemma. However, if we were playfully pursuing the metaphor of those California detective novels referred to above, it would have the requisite surprise whodunnit ending. While Schaeuble was the obvious chief suspect, perhaps abetted by lesser henchmen like Dijsselbloem, their dark doings would turn out to be the typical false clues of the genre. In the end, we would be surprised to discover an elegant, charming woman with a sometimes icy visage, who had been on the scene all along. 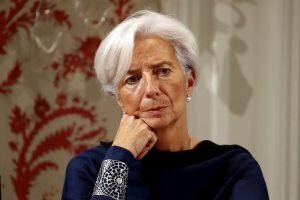 Despite knowing they were pursuing a policy set for failure, Lagarde and the IMF staff persevered, in order to avoid risks to their own credibility. “The injustice is that the cost of the bailouts was switched to ordinary Greek citizens – the least able to support the burden,” said The Telegraph, “and it was never acknowledged that the true motive of EU-IMF Troika policy was to protect monetary union. Indeed, the Greeks were repeatedly blamed for failures that stemmed from the policy itself. This unfairness – the root of so much bitterness in Greece – is finally recognised in the report.” This independent assessment is important. Since Varoufakis will inevitably be blamed for merely telling “his side of the story,” here’s outside confirmation of his major claims in Adults in the Room – a vindication of his credibility, however bittersweet. He pointed to nascent signs of recovery. Although more than a million Greeks, or 21.7 per cent of workers, were still unemployed, that was down from 27.9 per cent in 2014. 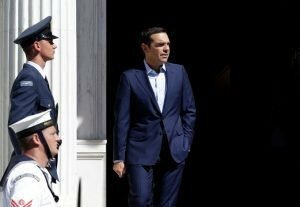 Among Tsipras’s goals is a further 10 per cent drop in employment, but that is “in the next five years,” the article reported. Some Greek bonds would soon be back on the market, and credit ratings agencies were about to upgrade the country’s status. “I have made mistakes… big mistakes,” Tsipras readily admitted, adding that maybe his biggest initial blunder was “the choice of people in key posts.” Asked if he was referring to his former finance minister, Tsipras politely denied it, claiming that Varoufakis was the right pick for the early strategy of “collision politics,” but allowed that Varoufakis’s drastic Plan B for a possible Grexit was “so vague it wasn’t worth talking about.” Nonetheless, Tsipras had paid the price for his U-turn of acquiescing to neoliberal austerity policies: his own ratings had nosedived, reported the article, citing polls that show Syriza trailing by as much as 16 points, and that its charismatic leader was widely regarded as having lied. Be that as it may, I probably wouldn’t want to go as far as Mason does.The genre of political memoirs tends to be very uneven – ranging from campaign-trail potboilers to half-baked manifestos to self-serving “what happened” accounts by defeated candidates (yes, that’s a nod to Hillary Clinton’s recently-published apportioning of blame for the 2016 American presidential outcome). But by whatever standard such memoirs are judged, Varoufakis’s book is very good, very readable, and ought to be on all the important “notable books of the year” lists. However, the book’s success is not what worries me. I’m concerned that not enough people will be inclined to pay attention to the story of an obscure economist who briefly served as a government official in a small, bankrupt country in southern Europe — a country that all of the powers of the European Union refused to rescue from a decade of human misery.